Organised retail in its fold has brought about several changes in the retail industry. A lot of attention is paid to how the consumer ‘feels’ and how s/he is treated. Emphasis on retail design, the look and feel of a store and the consumer’s experience in a store are few examples of the changes that have come about in modern retail. 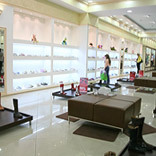 Visual designers have come to realise the role that a store design plays in influencing purchase decisions of a consumer. And so, they work to the minute detail on how the store looks. That 70 per cent of the purchase decisions happen on the store floor is a fact a retailer can not ignore. Yuri Bolotin, Principal, Design Portfolio, Australia, says, “Retail design can increase sales of a store, provided the productive sq. mts (the retail floor) are effectively designed, keeping that purpose in mind.” ‘In-store’ decisions to buy a product depend on a lot of factors like, the quality of the product, durability, pricing and so on. But the buck does not stop here, aspects like how the merchandise is placed, whether the in-store advertisements are properly put, what kind of music does the store play, how does it smell, what is the colour-scheme of the walls, is the ambience pleasing or otherwise are important for a visual merchandiser to take care of. Enhancing the shoppers’ experience by indulging all their senses in a store can spell profit for a retailer. The USP of any brand, apart from the quality of its product, should be the ‘experience’ the brand gives to its consumers on the retail floor. A good experience is one which is sensory and can involve all the senses of sight, smell, sound, touch and taste. Manu Neelakandhan, Design Director, Idiom Design & Consulting Ltd, says, “Try and involve all the senses to attract the clients. The emotions should move from attraction, interest, desire, action and ultimately to satisfaction at having received the best that the retailer has to offer the clients.” A store should always be viewed as a catalyst for raising revenues for the retailer. And therefore, its layout’s importance can never be over stressed. Sight: The first thing that motivates a consumer to walk into a store is how the store ‘looks’. A welcoming and friendly store always scores a plus over those which are not. Bright colours, well-placed merchandise and in-store advertisements, all go into working for creating that ‘sight’ for a consumer. For example, in a furniture store, facts and helpful tips by interior designers can be put up next to merchandise to aid the consumers. They can see, read and take informed decisions. Sound: Cacophony and chaos is not something that a retailer should ever associate his/her store with. Neither is silence a good option. Indulging the sense of sound through pleasing music (in accordance with the merchandise and brand concept) is a must. At an apparel store for young adults, fashion shows on screens and tips by stylists can be aired in the store to help shoppers select clothes for themselves. Interviews or quotes by famous authors can be played at bookstores to educate the customers on what books to pick up. Smell: A pleasing smell always adds to the ambience of a store. Musty odours or strong paint fumes can act as a deterrent for clients. A visual merchandiser while working in accordance to the retailer’s details should always keep in mind the sense of smell of a shopper; especially in the case of an F&B outlet, where bad odour is just unacceptable. A good odour is a sure-shot bonus to the store, it may not be remembered always, but its absence shall surely be remembered. Touch: This is a tricky sense to indulge in, but most vital. For today’s quality-conscious consumer it is more than a necessity to be able to ‘feel’ the merchandise. Be it in trying on clothes in the trial room, or testing a perfume with a tester, holding a porcelain vase, feeling the texture of a glass table or judging the sturdiness of a hammock, the client should always be made to feel at home when it comes to the sense of ‘touch’. The worth this cannot be over emphasised. Taste: Not all retail stores can hope at utilising the sense of taste. But for those who can, like chocolate stores, candy stores, F&B outlets, snack and juice bars should aim at always treating the sense of ‘taste’ of their consumers. On the house samples for tasting, free dishes or drinks on certain amount of purchases or sweets and chocolates for kids at any other kind of store are a few ways the retailer can indulge in the sense of taste of the consumer. Pampering the five senses of the consumers ensures a sensory shopping experience for them. Working out the visual merchandising of a store with this end in mind can work wonders for a brand. The sixth sense, in this case, can be the sense the consumer exercises in purchasing the product. But that sense shall only prevail if the other five have been effectively stimulated!